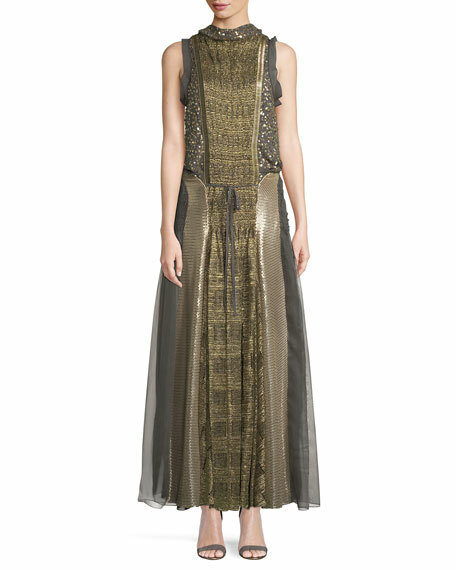 Chloe mixed-media evening gown with metallic, sequin embroidery, and sheer panels. For in-store inquiries, use sku #2496279. Badgley Mischka evening gown with jewel-embellished front inlay. Spread collar; high neckline. 3/4 sleeves; folded cuffs. Square-buckle belt. Trumpet silhouette. Hidden back zip. Train hem. Polyester/spandex. Lining, silk/spandex. Made in USA of imported materials. Galvan two-tone evening gown in lightweight stretch-jersey. Plunging halter neckline. Twisted waist detail. Cutouts from side to back. Draped skirt. Thigh-high leg slit. Hidden back zip. Floor-length hem. Viscose; bodice, viscose/nylon/spandex. Lining, polyester. Made in UK. 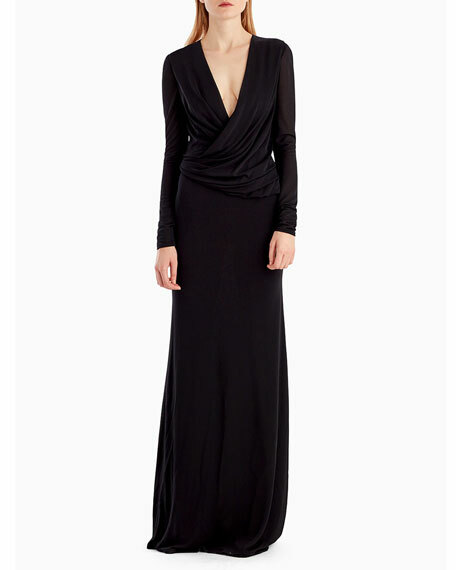 Jason Wu evening gown in jersey crepe. Draped, surplice neckline. Long sleeves. Column silhouette. Floor-skimming hem. Viscose/polyester. Lining, silk. Made in USA of Italian materials. 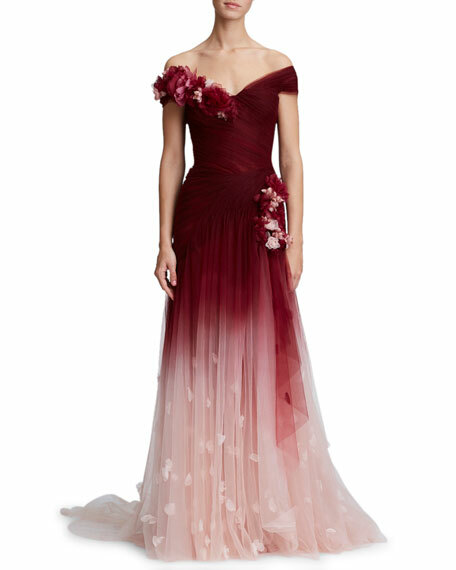 Marchesa evening gown in ombre tulle with 3-D floral appliques. Off-the-shoulder neckline. Cap sleeves. Fitted bodice. Softly pleated skirt. Hidden back zip. Train hem. Nylon; lining, silk/spandex. Flower, silk. Made in USA of French materials.